Ok, I know I didn’t provide an update last month. Quite honestly I had very little to write about. My trading in October was negligible. I closed two trades one winner and another a loser. My losing trade was in Analog Devices (ADI). On September 17th I sold to open OCT $49 puts for $0.75. At the time ADI was trading at $49.71. I sold the puts as the stock bounced off the lower Bollinger Band. My intent was to buy back the puts once the stock ran into resistance or hit the upper Bollinger Band. As you can see, after about three days the stock began to trade sideways. Had a stuck to my plan and exited I would have closed out the trade with a small gain. Instead I chose to hang on and hope that ADI would resume its climb to the upper Bollinger Band. Failure to follow my plan cost me dearly. I held on until OCT expiration but not wanting to have ADI put to me and not wanting to roll out to NOV I chose to buy to close my puts and accept the lost. As you can see I bought back my puts at almost the worst possible time. Shortly after expiration the stock began to rise. Had I simply rolled out at the $49 strike or down and out to a lower strike I could have managed the trade back to a profitable close. Alas, hindsight is 20/20. My revised plan is to resell another round of puts once ADI returns to a favorable trading position. Thus far that has not occurred and I am sitting on my loss. My winning trade in October was in T. R. Price (TROW). TROW is on my list of stocks that I’d like to accumulate for my retirement portfolio. On October 15th I sold to open the NOV $70 puts at $1.85. Like with ADI, TROW was at the bottom of the Bollinger Band and I sold the puts in anticipation of a bounce. However in this case, unlike ADI the trade worked in my favor. I was able to buy to close my puts just one week later on October 23rd at $0.30. Now let’s move on to November. This past month I successfully closed two trades, one in AT&T (T) and the other in TJ Maxx (TJX). On October 23rd I sold to open the NOV $33 puts for T at $0.36. At the time T was trading at $33.49. At November expiration T was trading at $35.28 and the puts expired OTM. My last closed trade was in TJX. 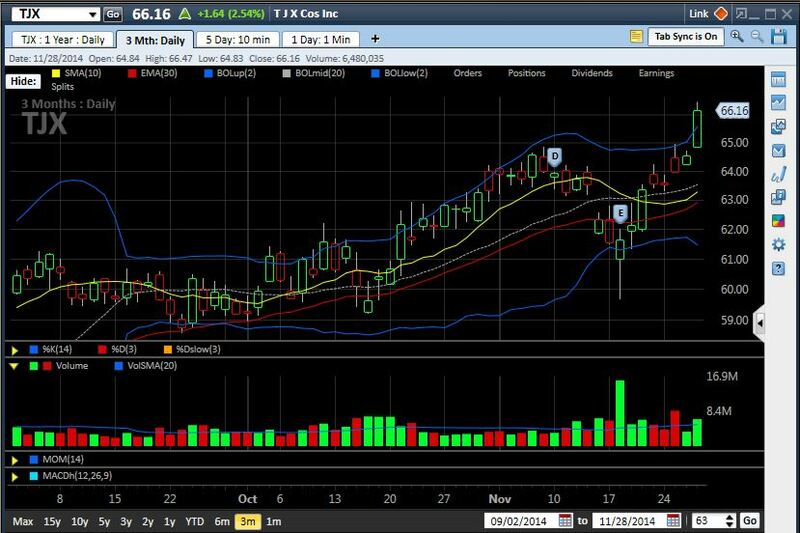 On November 19th I sold to open the TJX DEC $57.50 puts at $0.65. 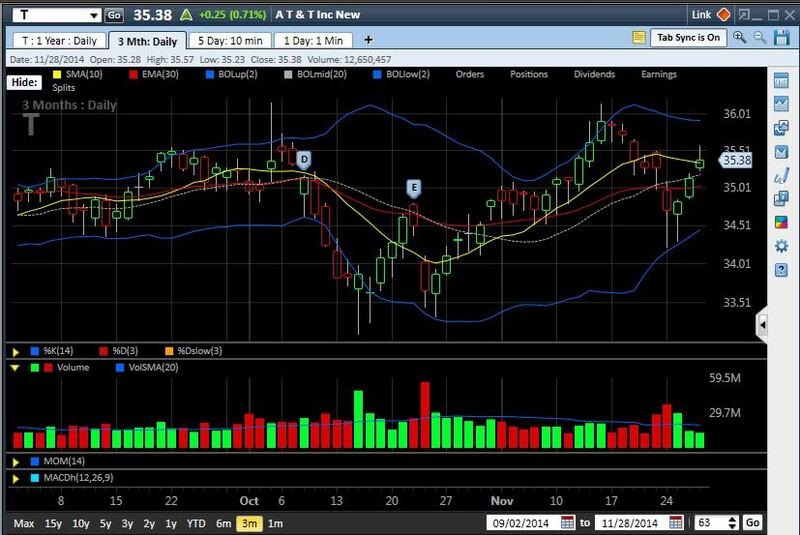 At the time TJX was trading at $61.35. 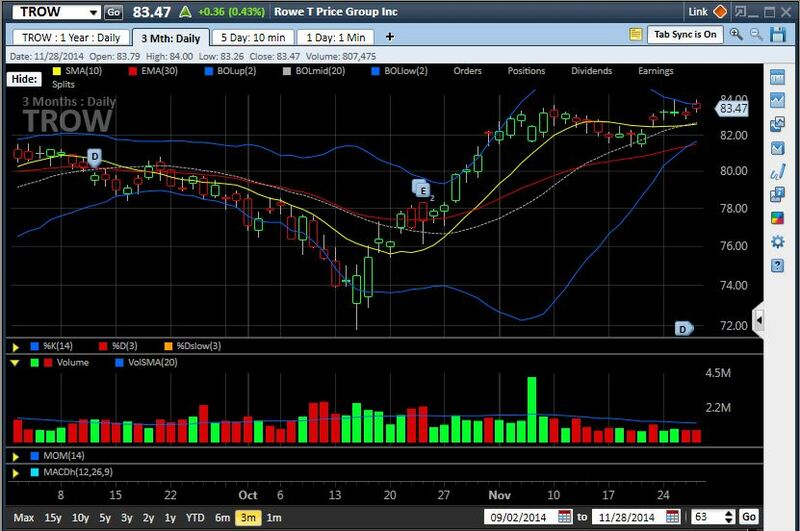 A scant 6 days later TJX was at $64.24 and I was able to buy to close my puts for only $0.05. That’s it for my closed trades. My trade in VALE remains open and I am actively working to manage my position by selling covered calls and buying them back when the opportunity presents itself. My newest open trade is in Occidental Petroleum (OXY). I used the energy meltdown on Friday to sell the DEC $75 puts at $0.77. At the time OXY was trading at $79.82. Well that’s it for another month. I’ll be back at the end of December with both a monthly and yearly update. There isn’t much to report for the month of September. The level of activity at work has severely curtailed my trading. This is both a good and a bad thing. Good in that it has allowed me to miss several ‘opportunities’ which likely would have resulted in a bad trade and would have put me in a rescue mode. Bad in that I did make a few snap decisions which I’m now regretting. Let’s first look at the trades I closed in September. I closed 3 trades in September. They were in KMI, TGT, and TROW. KMI is a stock in which I’m looking to build a long-term position. I have been trading naked puts in KMI since February. The range of puts I have sold has been $32.50 – $37.50. In September I had 2 SEP $37.50 puts expire OTM. This trade netted me $118.05 with a ROIC of 1.57%. I kept the trade very small because I felt KMI might fall further and I wanted to be able to roll out and down while increasing the number of contacts as necessary. That didn’t happen so I’m happy with a small profit. Next up is TGT. My TGT trade started back in early August as a buy/write in order to capture the dividend. I bought the stock at $58.06 and sold the AUG $58 calls. The calls were exercised and I had the stock called away from me at expiration and after the ex-date. The dividend landed in my account on September 10. This trade was also small, only a couple hundred shares. I netted $195.10 and my ROIC was 1.68%. My last closed trade was in TROW. TROW is another stock in which I’d like to build a long-term position. Back in July I began this effort by selling the AUG $80 put. TROW fell significantly in AUG and rather than accept assignment I decided to roll the AUG puts out into SEP. TROW subsequently recovered and the SEP $80 puts expired OTM. This trade netted me $216.60 and my ROIC was 2.71%. I am now waiting to reenter the trade with NOV expirations being the target. Now let’s take a look at the new trades I opened in September. Actually one, VALE is a trade I opened in late August. You’ll recall I sold the SEP $12.50 puts for $0.15 and said I’d let the stock be put to me if they expired ITM. The purpose of doing so was to be long the shares and in a position to capture the substantial $0.40 semi-annual dividend whose ex-date is October 17. The trade started out as planned but has fallen much further than I anticipated. I am now sitting on a substantial unrealized loss as I bought the stock at $12.50 and it closed today at $11.31. This, however, is an improvement over its low last week of $10.61. My plan remains to sell $12.50 calls after it recovers and I’ve earned the dividend. Now it just looks like it’ll take a bit longer than I originally anticipated. My new open trade is in ADI. Specifically, I sold the OCT $49 puts at $0.75. This is one of those cases where I took my eye off the ball and let the trade run away from me. My original intent was to sell the puts as the result of the stock hitting and bouncing off the lower Bollinger Band. The trade was to end when the rebound petered out and I had captured a large portion of the initial premium. Unfortunately as I mentioned at the beginning of the post I’ve been very busy at work and I missed the turn in the stock. 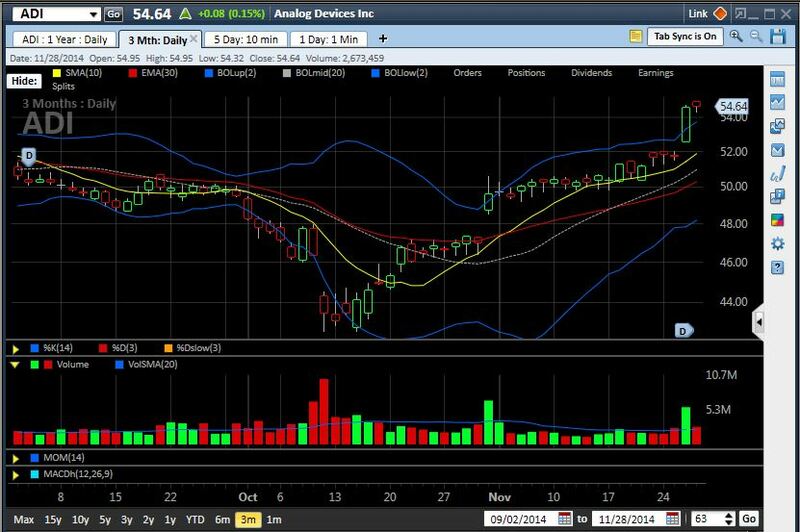 ADI got as high $50.64 after bouncing off the lower Bollinger Band at around $48.72. Today, ADI closed at $47.15. Unless we have a big bounce in ADI before expiration, I’ll need to roll this position out and down. I’ll likely increase the number of puts in the trade and roll down to the $48 strike. So there you have it. That’s the extent of my trading during September. Best of luck to everyone as we head into the historically volatile month of October. Well, weren’t the last 4 days fun? Not! As promised, here’s an update on the potential trades I referenced in my earlier post. (1) Stryker (SYK) – Well, this one fell much like everything else in the market. It now has fallen to the bottom of the Groenke V and has a TAI status of GR (get ready), and a Gold $ score of 70. On the plus side it has a good BR (buy rank) of 5.05 and is well under the BL (buy limit) of $44.03 . I’m going to keep it on my watch list. A rally in the market would quickly rekindle my interest in establishing a position in SYK. (2) ABB (ABB) – The situation with ABB is similar to Stryker. The market sell-off has pushed it down and it is now just below the bottom of the Groenke V. It now has a TAI status of GR and a Gold $ score of 40. I’ll keep it on my radar screen for a potential CC play in the future. A more immediate opportunity (albeit with more risk) might be to sell the Mar 10 puts for around $0.25-0.30. Note: this NP trade wouldn’t meet Ron’s criteria. (3) Analog Devices (ADI) – This one still remains a viable candidate. Even with the market setting new lows ADI still remains inside the Groenke V, has a TAI status of TA (take action), and a Gold $ score of 70. Further, it has a reasonable BR of 3.00 and at $19.30 is under the BL of $20.76. A couple up days would make this an almost perfect set-up for a successful CC trade. (4) Activision Blizzard (ATVI) – Activision is much like the first two, SYK and ABB. It has fallen to the bottom of the Groenke V and is rated GR. (1) XLK – It seems I have to keep repeating myself. XLK has now fallen below the Groenke V and has a TAI status of GR. Hopefully the market will turn around soon. (2) EWZ – I still like EWZ. It is just inside the bottom leg of the Groenke V, has a TAI status of TA, and a Gold $ score of 70. It very much is like ADI. A couple day rally could present a very nice entry point for a CC trade. Impatient and more aggressive traders might consider selling March NPs as there are several at various strike prices with enticing premiums. (3) XME – This one has an interesting chart. Like the others we’ve discussed, it is now outside the bottom leg of the Groenke V and has a TAI status of GR. What makes XME different and interesting is that it isn’t a sharp price drop that has caused it to drop out of the V. Rather, it moved outside the bottom leg because it has been moving sideways for so long. Looking at the available option chains reveals many potential CC and/or NP trades. This one intriques me, despite not meeting Ron’s criteria. Well, that’s it. As you know from my earlier post, I pulled the trigger on my XLE put trade. So far so good. Even with the steep sell-off I’m still well north of my $39 strike price. I’ll be back later this weekend with an update on my January trades and other open positions. Well, here we are just 4 trading days left before expiration on Friday. I’ve started looking at potential trades for February. Who knows what will happen between now and the market close on Friday but here’s what looks interesting to me right now. These trades are listed in my order of preference based on various fundamental and technical indicators as well as perceived risk. (1) Stryker (SYK) – Great Balance Sheet, Recession resistant business, and a very nice looking chart. (2) ABB Ltd (ABB) – Solid Balance Sheet, and a timely infrastructure play (think “stimulus” package). (3) Analog Devices (ADI) – Great Balance Sheet, bad news appears to already be priced in. We’ll find out after market close on Wednesday. (4) Activision Blizzard (ATVI) – Great Balance Sheet, most aggressive idea. (1) Technology Sector SPDR (XLK) – CSCO, INTC, GOOG, MSFT, T, VZ all in one trade; what’s not to like! (2) iShares MSCI Brazil Index (EWZ) – in my opinion the least risky of the emerging markets. (3) SPDR S&P Metals & Mining (XME) – chock full of beaten down commoditiy and mining companies. (1) Energy Select Sector SPDR (XLE) – like it again this month. As I mentioned above, these are my POTENTIAL trades for February. Who knows what any of these will look like by Friday. I’ll be back with another post after the market close on Friday. I’ll update you on the potential February trades outlined above and give you some ideas on what I will be looking at going into the weekend. In addition, I’ll let you know how my January picks turned out. Here are the potential trades I’m considering when the market opens on Tuesday. (1) Our position in XLI remains open after our Jan 22 calls expired. The ETF closed Friday at $21.82. Thus, I intend to STO the Feb 22 calls (XDLBV) at around $1.05. (2) I’m also considering selling naked puts on the SPDR Energy ETF, XLE. Specifically, I’m looking at selling the Feb 39 puts (XLENM) at around $0.78. I’ll provide more details on these trades after I’ve entered them on Tuesday. For those of you interested in additional trades here are some others that look good to me. (1) Buy XLE around $46.50, STO Feb 44 (XLEBR) at around $4.55. (2) Buy RSP around $26.70, STO Feb 27 (RSPBP) at around $1.20. (3) Buy ADI around $19.80, STO Feb 20 (ADIBD) at around $1.20. (4) MSFT also looks interesting this month. However, I’d wait until after their earnings announcement later this week.